This wooded property is uniquely situated and close to many attractions that include golfing on courses too numerous to mention, hiking, skiing on Mt. Hood, waterfall viewing in the Columbia River gorge, fishing, on nearby Sandy, Columbia, Clackamas, Willamette and Zigzag rivers, rafting, wine tasting, shopping and more. You can stay at Caramore Cottage and go to the Oregon coast and back one day, or Mt Hood (45 minutes) or fishing in the numerous nearby rivers. 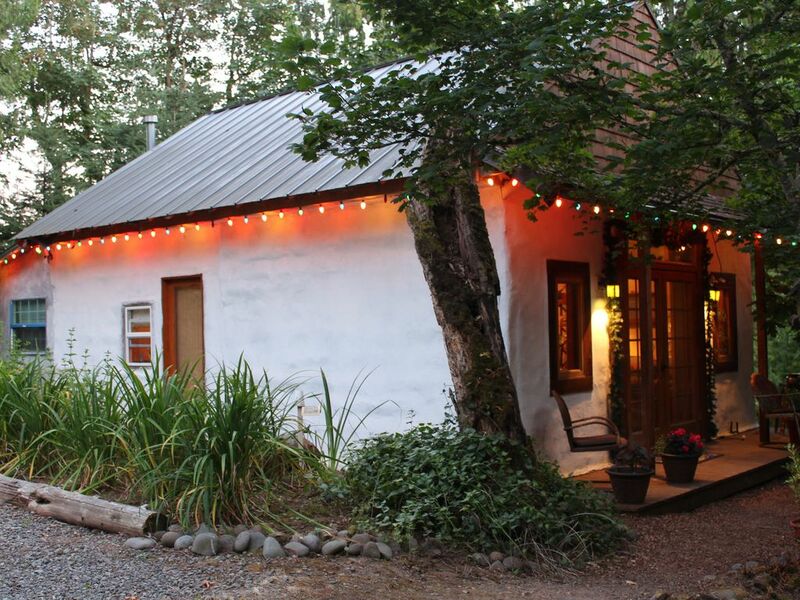 There are no other homes visible from this green (straw bale) cottage in the woods. Lots of squirrels, deer, owls, birds, trees and ferns. A great spot less than 30 minutes from Portland airport and city center that lets you feel you are away from it all in your own wooded retreat. If you are planning a remodel in the vicinity and are considering staying in a hotel for a few months, this would be a great alternative. Need to make arrangements well in advance. Want a Romantic Get Away? : Make arrangements in advance and have flowers and champagne, chocolates or other favorite surprises waiting in the cottage when you arrive. Guys or girls Get-Away-Nite? : Perfect place to hang out and reconnect with special friends, go for a walk, chat it up and sit around a fire at night. Like being at a private campground. In the doghouse and need a temporary retreat? : Quiet contemplation, or need to scream in the woods. Have it your way at this private cottage. Roomy bathroom and nicely tiled shower with duo shower heads. Year round skiing on Palmer Glacier on Mt Hood. An outdoor firepit and picnic table are on site. A trail to a year round creek plus private walking trail about 1 mile long circle the property. Wireless internet and downstream Netflix an added bonus and included in all rentals. A referral to a private chef is available with prior notice. Fee and menu to be negotiated with chef. Between Portland and Mt. Hood. This cottage is ideally situated for anyone who appreciates fantastic geologic wonders. Beginning from the eastern Portland Metro area, witness the fabulous views of the rivers and waterfalls, the Vista House and Multnomah Falls. In one day you can easily travel the Historic Columbia Gorge Highway, circle behind Mt Hood and drive up to Timberline Lodge for dinner. You may want to make many stops along the way for picnics, hiking, photography or visits to the charming shops in Hood River, home of the International Windsurfing contests. Fresh caught salmon from Native Americans is almost always available in Cascade Locks at the foot of the Bridge of the Gods. Or make the circle in the other direction and go the Mt. Hood first, maybe go skiing or fishing, and end up in Troutdale for dinner at Tad's Chicken 'n Dumplin's! Movies have been made in this timeless restaurant on the Sandy River and our guests always have a window table. Other Activities: Hot air balloon rides, weekly waterfront events in downtown Portland, Saturday Market, Farmers Markets and fruit stands abound, nearby biking trails (Springwater Corridor). Resting, relaxing, smelling the fresh air of the forest, listening to the sounds of nature, seeing the stars at night, spending one on one time with your special someone. Ski: An hour or less to all ski areas on Mt Hood. Ski during the day and party in Portland at night.